In this edition of the SA parkrun newsletter, we hear about the the launch of the Boksburg and Harrismith parkruns. Root 44 celebrates their second anniversary in style while Alberts Farm celebrates healthy living! Don’t forget to take note of the upcoming anniversaries and launches! This weekend nearly 20000 runners from around South Africa and the World will be gathering to run the 90th Comrades marathon over a distance of 87 kilometres from Durban to Pietermaritzburg. Among them will be many parkrunners, and I would like to wish them all the best of luck. There will be some faster runners such as Shaun Mieklejohn (Dusi parkrun) David Ashworth (Bryanston parkrun) Liezel Meyer (Dusi parkrun) and many others who could do really well. Indeed Shaun is one of the favourites to win the masters (50-59 category) Shaun won the Comrades in 1995. But Comrades day will be littered with the presence of parkrunners of all abilities both running and seconding from the side of the road. Many of these folk began their Comrades marathon journeys with a 5km run at a parkrun. I am particularly proud of those runners. I wish them all a happy and exciting day at South Africa’s most famous race. I will be commentating for the SABC on the day and will be on the lookout for parkrun friends. If there is a television camera pointing at you don’t even think of walking!! If last year is anything to go by there will be a bumper turnout on Saturday at the KZN coastal parkruns as well. Last year Comrades marathon parkrunners from all over the global community gathered at North Beach parkrun the day before Comrades and it was a pleasure to welcome them to a South African parkrun. This year there are several parkruns from which visitors can choose. North Beach, Umhlanga, Amanzimtoti, Shongweni and Dusi parkruns are all popular choices. One of the motivations for starting Boksburg parkrun was to take some of the pressure off Ebotse and Modderfontein parkruns but I fear that parkrun has become so popular that all we have done is to create another large parkrun. 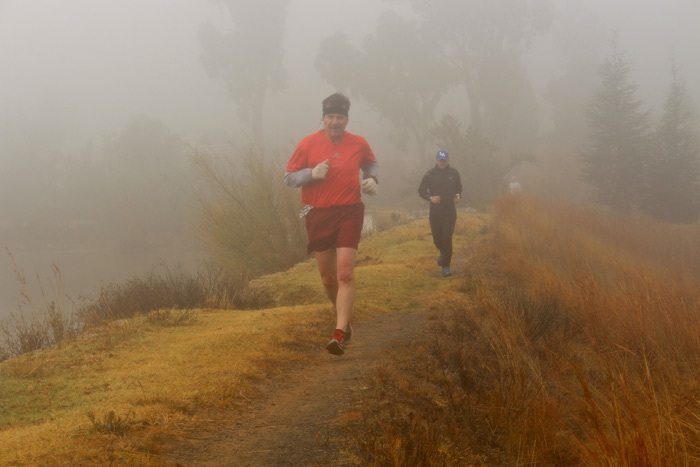 It was a chilly misty morning in Harrismith when we launched Harrismith parkrun last Saturday in a nature reserve below the famous Platberg Mountain. A crowd 0f about 60 local parkrunners and parkrun tourists gathered to meet event director Brenda and the team to run through the mist and occasionally bump into a startled Mountain Reed buck or ostrich. Afterwards all agreed the course was challenging but great fun and the mist lent a “Hound of the Baskervilles” feel to the whole experience. It was fun to check the Albert’s Farm parkrun results this Saturday and spot the name of my old running friend and rival Brian Chamberlain in the results. Brian ran with members of his family. For those who don’t know the name Brian is a former top class marathon runner who won many races in the 70s and eighties including the SA marathon champs and the Two Oceans in 1977 and 1978. He’s not running too badly now as finished 7th overall on the tough Albert’s Farm course. The May edition of our Media Partner, Modern Athlete Magazine is available online now! Subscribe to Modern Athlete here. 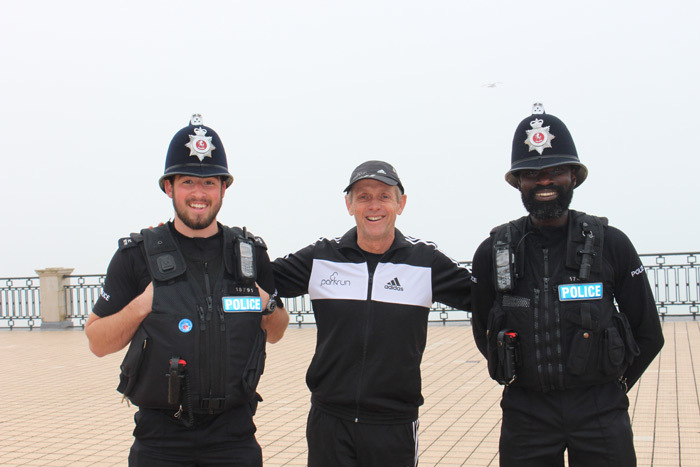 WIN with adidas at this week’s parkrun – 30 May 2015! adidas is giving you the chance to win a pair of adidas technical running footwear to the value of R1700 each. Come down to your local parkrun this Saturday and enter the competition at the adidas technical running stand at selected parkrun’s nationwide - Cape Town, Johannesburg, Pretoria and Durban. Don’t forget to ask an adidas brand coach about expert advice on our technical running footwear. They will be offering runners an opportunity to test adidas running shoes with boost technology for free and provide personalized fittings, allowing you to get the best solution for your unique running style. Are you smoker? Let Discovery Vitality help you to quit NOW! Cure your smoking addiction - click here. This method effectively removes the psychological dependence making it easy and enjoyable to get free from nicotine addiction. Available countrywide and with unrivalled worldwide success rates, they offer a unique money-back guarantee and as Discovery Vitality members you enjoy an unbelievable 80% discount off the standard rate. On Saturday 2nd May 2015 Albert’s Farm parkrun decided to have a fun morning and create a lot of excitement and activity! Blessed with the most beautiful winter’s morning, the event was used to ‘celebrate Life’ and create awareness as to a healthy living lifestyle with the assistance of CANSA. Lucy Balona, a regular Albert’s Farm parkrunner provided all the activity for the morning. Runners were encouraged to get their hair spayed by CANSA and at the same time were educated about causes cancer. After a good run, coffee and cupcakes were provided to celebrate my 50th parkrun. It was a goal that I had set myself last year and I am committed to our parkrun being used to educate and promote a healthy lifestyle. It was very fitting that my grandson, Adam Confait, also completed his 10th parkrun on the day. A very big thank you to all my volunteers and folk that made the morning such a success. This parkrun has truly become a community event! 930 parkunners joined in to celebrate Root 44 parkrun turning 2 on Saturday! Even though the weather turned cold, most stayed after parkrun for cupcakes, luck draws and prizes. The family prize went to the Leuvennink family, all 9 of them! Finishing in top spot of the annual Root 44 parkrun points table for the men, was Wilco Strydom and for the ladies, the lovely Carli Jacobs. We also had a fun prize for our identical, but talented twins, Alvin and Sylvin Dirkse, called ‘Double Trouble’. And we always honour our 80-84 age category record holders, this year it is Granny Naomi Leuvennink and Oom Daniel Strydom! As parkrun is part of the community we try to give back as often as we can. This year we did a drive to help out our local Animal Welfare Society of Stellenbosch. Thank you to everyone who supported! As I forgot to bring a knife to cut the cake, we decided to donate it to AWSS, which they auctioned on their Facebook page. Luckily quite a few parkrunners had slaved away baking cupcakes! Thank you so much to all our supporters and parkrunners who sponsored prizes. 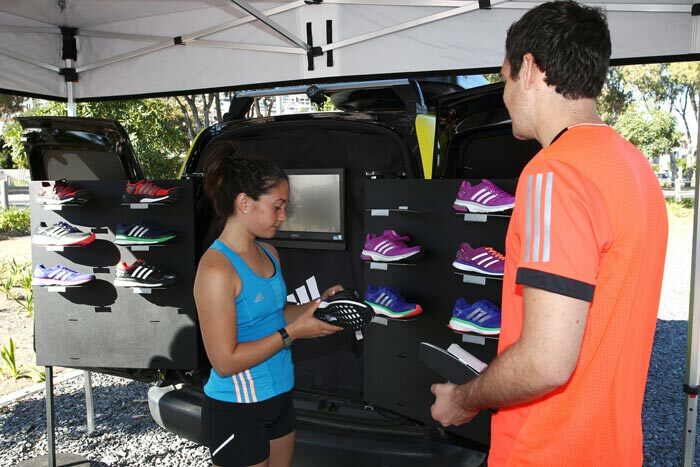 Thank you to adidas for coming out every Saturday with their awesome trial shoes and to our local sponsor for a monthly surprise! A very special thank you to Carmen from Queen of Cupcakes who made our stunning cake! Most importantly to all our parkrunners for your love and support over the last 105 parkruns, thank you! You make it worthwhile to volunteer every week! And lastly to my core team: Chris, Kobus, Ilse, Mariska, Lisa, Robyn and Kim, you are all superstars! Please have a look at our news page on for all the birthday details! I would like to acknowledge someone who must be South Africa's most committed parkrun volunteer, Mariaan de Lange. 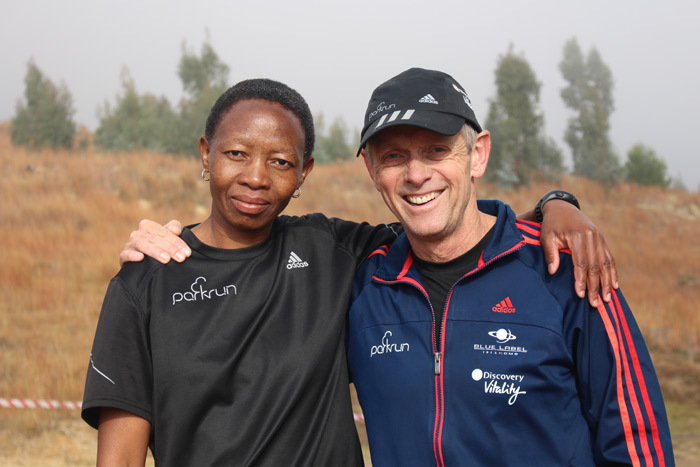 She is the sole volunteer at the Mashishing (Lydenburg) parkrun and I had the pleasure of meeting her when I did a 'visitor' run there recently. There are very few regulars (average 10) at this event and my wish is that all of her campaigning for support starts to pay off and that many new volunteers and participants step up. Not only does she keep it all going, and get the local press out to promote the event, but she is also an awesome person. When I ran there I had my little dog in tow and after the event my curious canine became over excited at the beckoning open farmlands and decided to add a few more kilometers on to her earlier 5. Mariaan helped me search the neighbouring farms for her for two hours until a contrite pooch turned up. Above and beyond the parkrun volunteer duty I'd say. I encourage parkrunners to pay Mashishing's venue a visit when in town and if you know anyone there who could help by getting involved some Saturdays, please send them Mariaan's way. 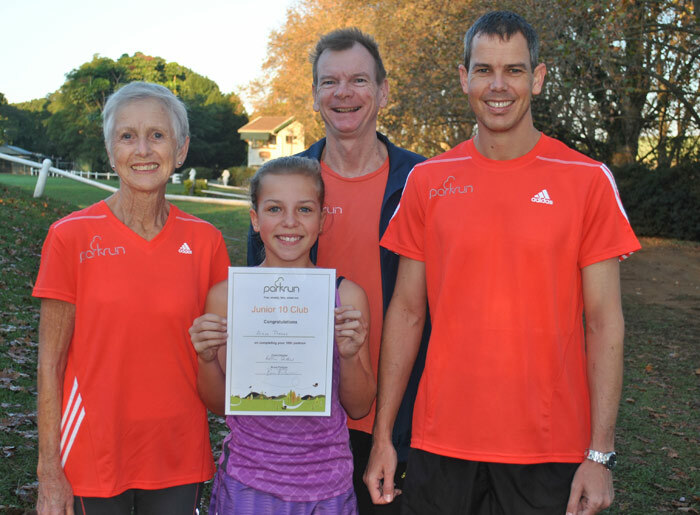 I was introduced to parkrun by my daughter, Jenny while visiting in Margate on the Natal South Coast and so on Saturday, 16 June 2013. I ran/walked my very first parkrun in a time of 55:50 at the Uvongo parkrun. The following week I decided to see what the Shongweni parkrun was all about and ran my second parkrun joined by my son Geoff for his first parkrun and his daughter Aimee joining us a few weeks after that. I am thrilled to have been instrumental in getting some of my family to join me on Saturday mornings. Hardly a Saturday goes by that I am not there for the 8 o’clock start. parkrun certainly grows on you and little did I know that very soon I’ll be part of a three generation achievement here at Shongweni parkrun. Now I need to get Jenny and her husband, Ty, to get us to a second three generation achievement at Shongweni. 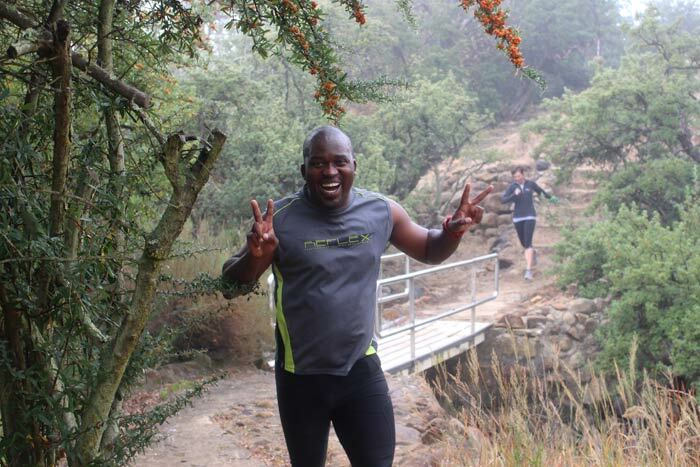 Shongweni parkrun has lovely park like surroundings and is a very well organised event and growing in numbers by the week due to the dedication and hard work and lots of encouragement by Robin, Jason and the Team. Volunteering is particularly interesting as you get the opportunity to meet the Team when setting everything up for the day and you also see each parkrunner/walker as he or she comes through the tunnel to be barcoded. I was fortunate to do nine parkruns in Australia of which seven were on the Gold Coast’s Main Beach and two at Augustine Heights, Brisbane. It is a lovely feeling knowing that you are part of this ‘worldwide family’ having one aim and that is to pitch in time to run/walk 5km on a Saturday morning. 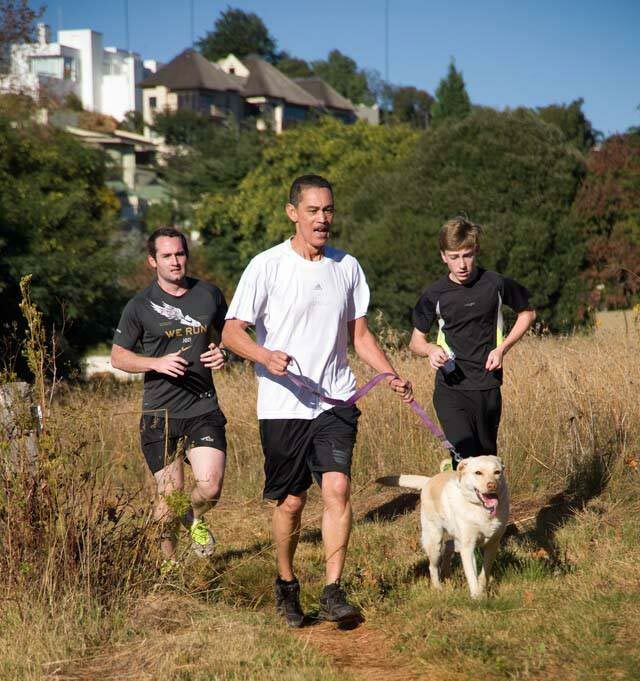 In this edition of the SA parkrun newsletter, we hear from Naval Hill and Bryanston parkrun. You can now get parkrun wallpapers for your smartphone! 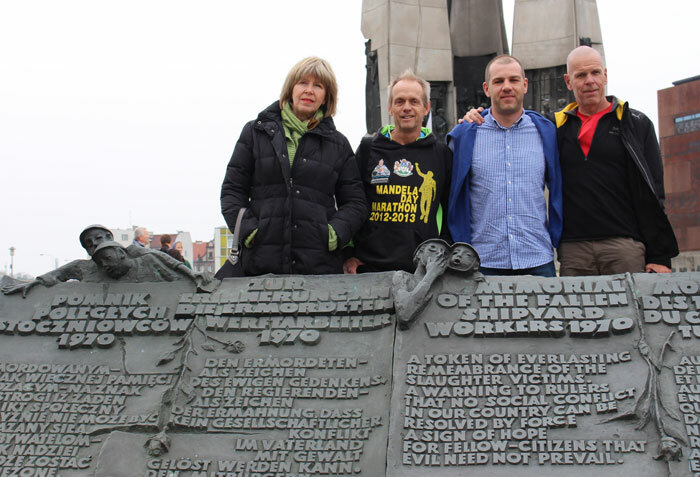 Gill and Bruce Fordyce visit UK and Polish parkruns, see what they have to say about their trip. Last Saturday Modderfontein parkrun organised a special celebration for World Move for Health day. Event director, Wayde Morsinck, assembled a team of 58 volunteers and prepared parking for fleets of cars. The new parking from the Marlboro road off-ramp worked brilliantly. 58 volunteers must be some sort of record for a single parkrun. 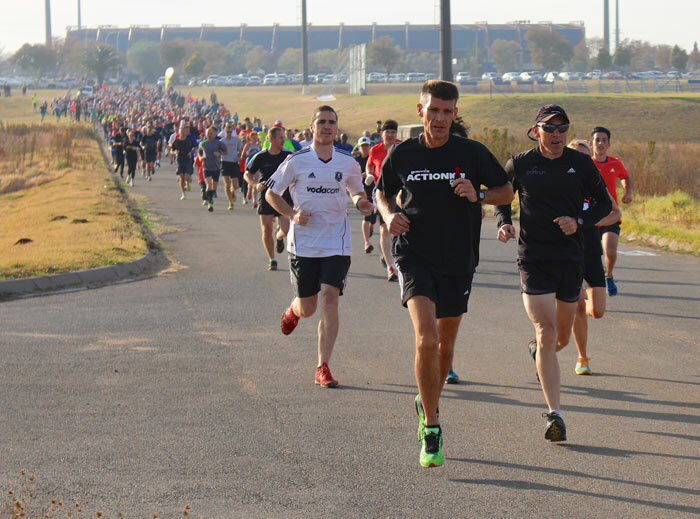 Over a 1000 parkrunners converged on Modderfontein and enjoyed an amazing parkrun on a perfect autumn morning. Wayde believes that his team can cope with up to 3000 parkrunners. Could we see a large crowd at Modderfontein’s 3rd birthday next January? We enjoyed running on the Leas above the beaches at Folkestone and on the Baltic seafront in Poland. Most importantly they made lots of new parkrun friends. In Poland country manager, Jakub and Aga Fedorowicz hosted us and we explored Gdynia, Sopot, and the Hel Peninsula. We also visited the Solidarity museum and enjoyed lots of Polish food. In the UK veteran parkrunner, Peter Fordham and his wife Julie hosted us (Julie ran her first parkrun ever at Delta Park Johannesburg despite living close to several UK parkruns. The bug has now bitten!) We were able to run freedom runs at Wimbledon Common and Crane Park parkruns. While in London we had a very useful meeting with parkrun founder, Paul Sinton-Hewitt and new parkrun Global CEO, Nick Pearson. There are some exciting new developments planned for parkrun in the future and we welcome Nick to the parkrun family. Two new parkruns are starting on the 16th and 23rd of May. The first is at Boksburg stadium and features a bright blue moveable bridge which was donated to the parkrun. 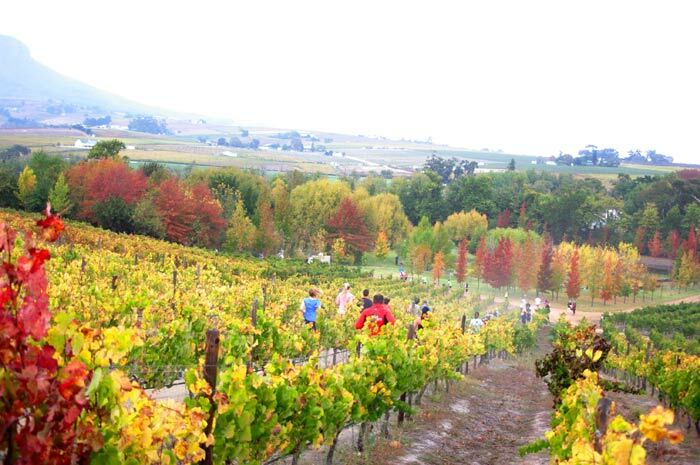 On the 23rd another Free State parkrun joins the family when Harrismith parkrun opens in the shadow of the famous mountain. parkrun global has launched parkrun wallpapers for your smart phones. Please see the website parkrun wallpapers webpage for download details and aspect ratios. There are 15 options to choose from. Join SA’s coolest new running and cycling club, Team Vitality! As a Vitality member, you can now officially join Team Vitality – our new running and cycling club – to get fit, save money, and connect with other fitness enthusiasts. 4. Exclusive access to our VIP hospitality at selected running and cycling events throughout the year! Naval Hill parkrun celebrates their first anniversary- We invite you to see the video here. 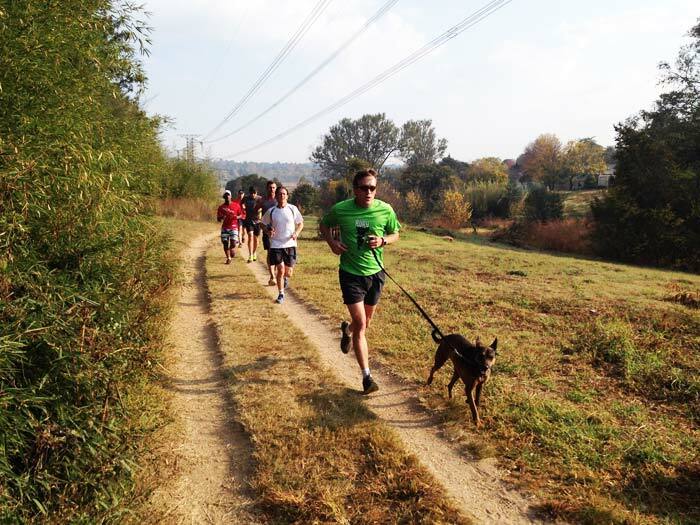 Bryanston parkrun has seen slight changes to the route in the past year. The course follows exactly the same path, however, instead of turning right at the end of the Jeep track, runners continue to run straight and follow the perimeter of the park in a clockwise direction instead of an anti-clockwise. The reason for this change is to avoid runners crossing each other on the return route to the finish. We are so used to keeping left that it caused so much confusion when parkrunners were asked to keep to their right on the paths. The second change is regarding the finishing funnel. We have extended the length funnel so that there is enough space for runners move into once they cross the finishing funnel. This has proved to be a solution to the large numbers we experience each week. The run directors (and various parkrunners who have emailed us), have kindly requested that dog owners remember the following rules; One dog per parkrunner on a short lead. The reason for this is that more than one dog causes congestion along the route (dogs do not walk in single-file), and long leads can trip runners. We must remember that it is a safety issue and not because we don’t like doggies. The second point is that if your four-legged friend leaves a presie at parkrun, please pick it up. As a participant, if you notice a dog relieving themselves, please encourage their owner to pick it up. I am sure we would all enjoy a clean path without having to scrub our shoes after every parkrun.